During the Edo period, the daimyo (Feudal lords) from each region was required to live in Edo (today’s Tokyo) every other year. This type of Kamishimo (official attire for samurai) with small repeated patterns (komon) was like their uniform when they attended official function in the Edo castle or others. Each region had their own design made. The characteristic of kamishimo komon was that it looked plain (one color) when it was looked at in the distance. The pattern of the Tokugawa shogun’s family is called same (shark) komon because it resembled the shark skin. 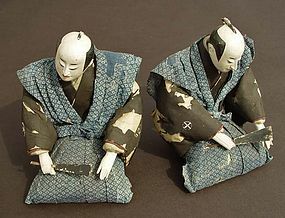 The pattern on these dolls is similar to the Kagawa regions. It was hand dyed as same as the real kamishimo; stencil dye (katazome) with natural blue dye (aizome) on hemp (ramie?). The size of the pattern is doll size. The crest on one doll (cross in circle) is famous; Shimazu clan from Satsuma. Damage on old black silk is unfortunate but very common (caused by old black dye). The kimono was sewn together with old washi (Japanese hand made paper). The old washi has its own tasty look and is amazingly strong. It appears to have calligraphy in black ink; it probably came from an old book? As the black silk deteriorates in time, the kimono without black silk will look perfect (though the color is not black) – there were some samurai’s gown made made out of washi paper in the old time. Paper made old samurai’s kimono or any kimono is very rare to be seen today but the one that we have seen in the photo looked more like leather and it was very beautiful. We repaired the jacket. The dolls are exceptionally well made with delicate details. Each doll is approx. 6 inches tall.